When a weather disaster threatens to shut down the town and ruin Carla's birthday, someone must save the day. "Carla's Cloud Catastrophe" is a tall tale about a birthday-party-crashing cloud catastrophe that challenges Carla (whose birthday party it is) to come up with an extreme solution to save the day (and her birthday party!) The whimsical colored illustrations show puffs and piles of excess clouds everywhere except up in the sky where they belong. Kids age 4-8 will enjoy the ridiculousness of the cloud catastrophe and get caught up in the need for a quick solution to save the birthday cake (and party). 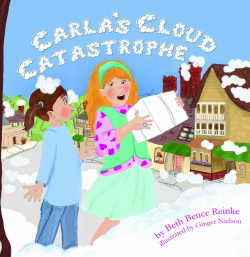 "Carla's Cloud Catastrophe" has lots of lovely descriptive prose as well as animated, dreamy illustrations, making it fun and memorable to kids everywhere.